♥Charmed, I’m Sure… My loves, the only thing truly better than pretty accessories is pretty accessories that harbor good luck. Charms with the ability to protect one from evil, and give the wearer a sprinkling of supernatural powers that put one in complete control. No, we are not talking about the inhumane rabbit’s foot so often seen dangling from the sterling silver keys kept in one’s pocket; nor are we discussing the clichéd horseshoe or four-leaf clover pendants. Rather, the accessories in question are the glittering amulets and talismans crafted by A Peace Treaty, as part of their Sunari Collection. Mimicking the aesthetics of ambrosial jewelry found littering the tables of outdoor bazaars found in the Middle East; each A Peace Treaty pretty contributes a touch of ethnicity to one’s look du jour making it a cinch to embrace this season’s tribal trend. I myself am swooning over ACHIN, TALOGAN, NAHRIN, and KONDUZ – all of which retain a sense of out of this world elegance in their designs. Which A Peace Treaty trinket is calling out to you, kittens? ♥Bite Me! You are all already quite well-versed in my devotion to cupcakes that are just as cute as they are scrummy; thus, I will not bore you with the back story of my adoration for what I like to refer to as cutecakes. I don’t, however, have any qualms about introducing you to the new object of my foodie affection…Baked By Melissa. Darlings I know I’m not the only one who is ready to try something new once I have savored the flavor of an item that is downright yummy after a singular bite. It is not that I am one who wastes considerable amounts of food; rather, I merely like to enjoy as many variations as humanly possible. And in the world of cupcakes, the flavors are endless leaving one unable to select just one to indulge in; Baked By Melissa is the answer to such dessert-inspired woes. No longer must one choose between Cinnamon or Red Velvet. Baked By Melissa serves up bite-sized cupcakes in nine yummy flavors – S’Mores, Tie-Dye, Mint Chocolate Chip, Cinnamon, Cookies & Cream, Cookie Dough, Red Velvet, Peanut Butter Cup, and Peanut Butter & Jelly – giving you the ability to forgo choosing one over another, and simply allowing one to try all nine. I’m curious to know, my love…what’s your favorite cupcake flavor? ♥When Did I Buy That? Kitty cats, though I try more than you can imagine to monitor my spending, and keep track of each and every item I buy – from miniscule packs of gum to the Philosophy di Alberta Ferretti Ankle Wrap Wedge Sandals that topped my need-it-want-it-gotta-have-it list for months; there are still times when I find myself gazing into my closet and asking…When did I buy that? It is moments like this that make me wish I had taken a cue from Kate Bingaman-Burt, and simply doodled minute pictures of every single purchase I made over the years, then published them within a book like Kate’s gem Obsessive Consumption: What Did you Buy Today? Chockfull of colorful scrawls depicting everything from Coke cans to quench thirst and fans to keep cool; to issues of Teen Vogue for expanding one’s fashion knowledge and ambrosial black owl earrings essential to any girl’s jewelry collection, Obsessive Consumption follows Kate’s purchases over a period of three years, effortlessly displaying just how much we are buying – oftentimes without even realizing it – in a playful volume that doubles as an easy breezy beach read or clever coffee table book! Tell me dolls…what did you buy today? Thanks to The Pink Boudoir and A Peace Treaty for the pictures. Those earrings are divine Erika and I never can keep track of everything I buy. But sometimes, I'm pleasantly surprised to see I bought something that is now perfect! Currently smitten with colorful fingertips! Happy weekend! I'm certainly smitten by the ankle wrap wedges by Mrs Ferreti. They look spectacularly chic AND comfortable (what a rare mixture). 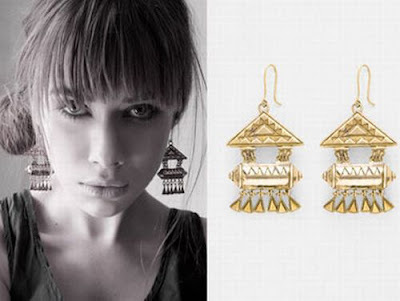 The earrings are also to die for; just lovely! Wishing you a great weekend, Erika! Cutecakes sound so perfect right about now! I love fruit flavors like lemon or (gasp) passion fruit. And I am smitten with Smitten Saturday. i am totally like that as well, i just want a bite of everything yummy especially when you're in a bakery shop! i'm smitten with great weather and bbqs! Erika, I am soooo craving a cupcake right now! lol. I love those ankle-wrap sandals, I think you may have a bigger shoe obsession than me! lol. I totally love teen vogue too. :) I am 24 and I still read teenager magazines, they are so much more fun! That drawing everything you buy idea sounds really good! Although I would be afraid to put it all together, it would give me a reality check! Oh my jesus! Those cupcakes are absolutely ADORABLE. I'm in love. Definitely must add to my must see list of cupcakes. Gotta love "cutecakes", as you say, I love it. wow, those are some beautiful things from a peace treaty. so many thing to obesse about now. These are so beautiful. Really, a great post! i had a great week!!! :) great writing, as always! and i love the word you used: "cutecakes." That book sounds like so much fun. I'm definitely going to pick up a copy. Wow I love these earings, some of the most unique and amazing style that I've seen in awhile. Must pick up a copy of that book, and by golly (yes, I just used the word golly) charms are amazing. Great post, you write with an air of charm. Lovely earrings!! I would buy those if I could afford to shop right now. I don't even want to try to figure out how much I may have spent in the past, as I've gone through quite a few shopaholic phases. And I love cupcakes too! Red velvet is my favorite with some whipped frosting. Mmm! The earrings are lovely ! Thankyou so much :) That earrings are stunning ! i love those earrings, so cute!!! thanks to you i am now smitten with those feretti wedges! - a pair of diamante sandals that i am waiting to wear - i wish the sun would hurry up and arrive in the UK so i could test drive them! And those earrings are exquisite! The earrings are beautiful and I can't wait to get my hands on the book with the beautiful drawings. Although it does remind and scare me how much I "buy" and don't think about a lot of it! Yikes! A Peace Treaty looks like it has some amazing jewellery. I am such a jewellery obsessed person, that I can't wait to check it out! nice post. i adore the earrings youve posted here. so cute. i do love oversized earrings. Those earrings are heavenly.. I'm getting a serious edie sedgwick vibe from them! Love those tribal pieces! So amazing!